CISF Constable Fire result - cisf.gov.in - check CISF Result of Constable (Fire) Merit list Cut off marks. Central Industrial Security Force (CISF) had successfully conducted Constable Fire written exam 2016 on 22.11.2015, 29.11.2015 and 06.12.2015. The test was held for filling up the temporary posts of Constables/Fire in Central Industrial Security Force in the Pay Band – 1 Rs.5200-20200 + Grade Pay Rs.2000/-. 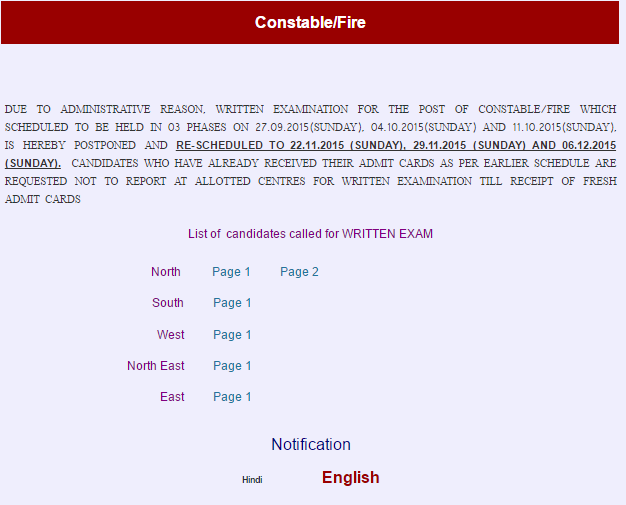 To know about CISF Constable Fire Exam result, check details given here. All question of Constable Fire written exam were objective type. Total 100 Questions have been asked for answering in 2 hours Time. Constable Fire written exam carry 100 marks and time given was 2 hours. Through the result, candidates can know how much marks they can score in the written exam. Whether they may be able to qualify the test or not. Merit lists in each category (UR/SC/ST & OBC) will be drawn separately in respect of each State/UT on the basis of aggregate marks obtained in the written test. In case of tie in marks, the candidate with older age will be higher in the merit list. Further tie shall be resolved by comparing the height, educational qualification and alphabetical position of the first name in sequence till the tie is resolved. Candidates with more height, higher educational qualification and earlier position of first name in alphabetical order will be placed above. Candidate who qualifies in 5 KM Run, Physical Standard Test, Identity Check and documentation have to appear for this written examination. 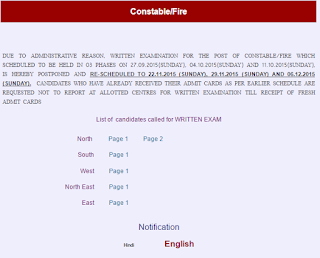 CISF had conducted written exam on 22.11.2015, 29.11.2015 and 06.12.2015 for Constable Fire posts. Now written Result are available. CISF had released the list of provisionally selected candidates for Medical examination for the post of Constable/Fire in CISF-2014. Call letters for Medical Examination will be issued shortly. The results are expected to be announced in 2-3 months time. The question paper was set to assess the general awareness/general knowledge, knowledge of elementary mathematics, analytical aptitude and understanding patterns, basic knowledge of the candidate in English/Hindi. The questions was set both in Hindi and English. General & Ex-servicemen : 35% and SC/ST/OBC : 33%. The final selection of the candidates will be made in order of merit in each category and allotted vacancy to each State. Those who clear the written exam held on 22, 29 Nov and 6 Dec 2015, will have to appear for Medical examination. CISF will upload the list of successful candidates in the written exam. We are here to update you on this CISF result. Candidates who find a place in the select list as per the available vacancy in each category in the state will be called for medical examination. Candidates will be classified as “FIT” or “UNFIT”. There is no provision of “Temporary Unfit”. Those found fit will be issued offer of appointment. As far as the medical standards are concerned, candidates should not have knock knee, flat foot, varicose vein or squint in eyes, bow legs, inability to close the left eye, Inability to flex the fingers properly and any other obvious deformities. He must be in good mental and bodily health and free from any physical defect likely to interfere with efficient performance of the duties.